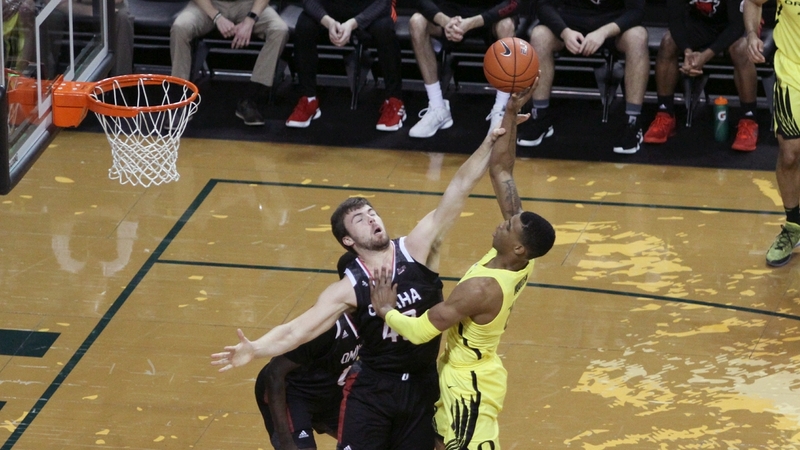 Dana Altman has been waiting for his entire team to show up and on Dec. 8, it finally did. Oregon (5-3) played its first seven games without the key cog of Louis King. But the McDonald’s All-American debuted tonight and made an immediate impact. King scored 11 points in his 16 minutes of action to help the Ducks to a much-needed 84-61 win over Nebraska-Omaha (3-7). While King’s 11 points doesn’t seem like much, his presence on the floor made a huge impact on the other players. It’s no coincidence that Kenny Wooten scored a season-high 20 points to go along with five rebounds. At 6-9, King showed what kind of a nightmare he can be for smaller defenders. The Mavericks’ defense, and every other defense that follows, won’t be able to key in on Bol Bol, which frees the big 7-2 center to play with just one guy on him. Bol took advantage with 18 points and 10 rebounds. Victor Bailey, Jr. poured in 16 points on 5-of-6 from the field and four treys from the outside. Payton Pritchard managed to dish out 10 assists as well. Oregon’s rotation is now a bit longer and more experienced. Will Richardson and Abu Kijab was placed into the starting lineup with seniors Ehab Amin and Paul White coming off the bench. White had his best game since the season opener by sinking a pair of threes. No one is going to confuse Nebraska-Omaha with UCLA or Arizona and Oregon will face stiffer competition soon, but after losing two in a row, the Ducks needed a win. Perhaps even more than a win, they needed confidence and maybe a little hope. The pre-season Pac-12 favorites were upset at home by Texas Southern and looked lackadaisical at Houston. But all of that changed against the Summit League member. Oregon shot 59 percent from the field (33-of-56) and sank 12-of-23 from beyond the arc. King made his first three treys and Bol also hit a couple of threes. Zach Jackson led the Mavericks with 21 points and JT Gibson added 18. The visitors shot 42 percent (21-of-50), but managed to stay relatively close thanks to a dozen three-pointers of their own. But Oregon used its height advantage time after time to get easy offensive rebounds and put-back hoops. The Ducks dominated on the boards to the tune of 36-13. They almost had as many offensive rebounds (10) as Nebraska-Omaha had for the entire contest. It was a close game early on, but when Oregon went on a 16-2 run to break out to a 25-10 lead, the Ducks never looked back. The schedule gets a bit tougher on Wednesday when the Ducks will face a 7-2 San Diego team. The Toreros have defeated Colorado earlier this season and almost upset Washington in Seattle before going down 66-63.